So while playing around on the internet today I came across the neatest idea. 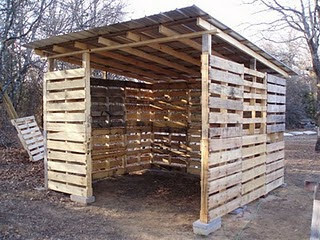 This shed is built of discarded pallets. What a neat way to recyle - Larry has given me the o.k. to do this so I will be collecting pallets over the winter and come next Sping we will be putting one of these up to use as a goat shed for the goats that we want to get.